Professional Pest Control in London. Your cat has brought in fleas from outdoors, and you can’t seem to get rid of these nasty biting creatures? Just call Thomsons Cleaning. We offer professional pest control services for domestic and commercial customers in London. Our professional and certified pest control technicians will not only take care of any kind of pest infestation, but can make sure that future infestations are prevented as well! All the insecticides, pesticides and other pest control tools are from an approved UK supplier. We offer one-off, preventive, guaranteed pest control as well as general fumigation. To receive a free price offer for a pest control service do not hesitate to call 020 3746 0000 or send an online request here. Our customer care operators are obtainable 24/7, so call right away! Thomsons Cleaning is known for its efficient, quick and hassle free pest control service in London. We can handle a wide variety of flying and crawling insects, as well as rodents and other pests. Our complete pest control service includes: inspection, treatment as well as preventive actions. Our experienced pest control technicians are certified by the British Pest Control Association and have successfully passed the Kill Germ and Safe Use of Pesticides courses. They are native English speakers, who are thoroughly vetted and referenced. We use only UK pest suppliers for our insecticides and pesticides. Our company provides a fully insured and guaranteed pest control service to all domestic and commercial customers in London. 96% of our customers are satisfied according to our regular surveys. For their convenience, we offer same day, emergency pest control, and work on weekends and bank holidays. The pest control technician does a very thorough inspection of the property (either indoors or outdoors), in order to determine the type, the source and the level of the pest infestation on the property of the customer as well as possible entrance points and risks for future infestations. A full and detailed report will be provided to you. You will also be given very detailed and clear safety instructions about the preparation and precautions which need to be taken before, during and after the pest control treatment or fumigation. The safety instructions include getting all of the pets, including fish out of the property before the treatment. Also making sure nobody is in the property during the treatment and at least 2 hours after it is done. After you return, you will need to open all windows and leave them open for 10 minutes. Also, in order to prepare the property, you are asked to hoover it thoroughly before the treatment, and abstain from hoovering it for 4 days after the pest control treatment. If you pick our guaranteed pest control service, you will receive a 3 month guarantee, which includes 2 free visits by the technician in the next 2 months. 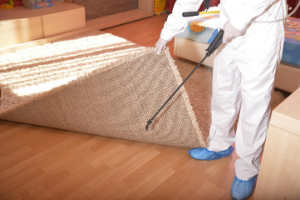 Our trained and experienced pest control technicians can deal with a large number of various pests, including spiders, cockroaches, ants, dust mites, fleas, woodworms, silverfish, wasps, flies, moths, bees, carpet beetles. We can help resolve and prevent rodent infestations as well, including: rats, mice or squirrels. To get rid of any type of pest or to make sure you stay pest-free, book our professional pest control services. Contact our 24/7 customer care operators at 020 3746 0000 or online with your booking request. It will be processed quickly, and you will receive written confirmation in 2 hours via SMS and e-mail. Same day emergency service is possible. If you book ahead, you will get a preferential price. Regular customers also get preferential prices, as well as landlords and estate agencies. If you book a combined pest control service or pest control and another one of our cleaning and maintenance services, you will receive a serious discount from their prices. Our service is available 365 days a year (holidays included), so just pick a day, and contact us now!